The Asian-Pacific region is drawing global attention for its remarkable economic growth. This rapid economic expansion has, however, also aggravated urban problems associated with a massive influx of new residents. In response to this a social situation, the Asia-Pacific City Summit has been held every other year since 1994, as a forum where leaders of Asian-Pacific region can get together and have exchanges of opinions in a candid manner. The purpose of the Summit is to promote friendship and mutual cooperation in this region toward solution of urban problems and network-building for further development of Asian cities. To realize the objectives of the summit, the Working Level Conference between those persons working at the front line of urban administration, has been held in the year following each summit, beginning in 1995. “A” which ahs the meaning “Answer” or “First Class” taken from the initial letter of “Asian-Pacific City Summit” is used to from the shape of the logo. Each vertex of the triangle has a meaning “Exchange”, “Understanding”, and “Cooperation”. The triangle which is formed by connecting the three vertexes together indicates the state of various cities in the Asian-Pacific region gathering for the Summit. Since ancient times, the triangle has been a symbol of unity for all things under the sun, It is to embody the image of the direction which the Summit heads for. 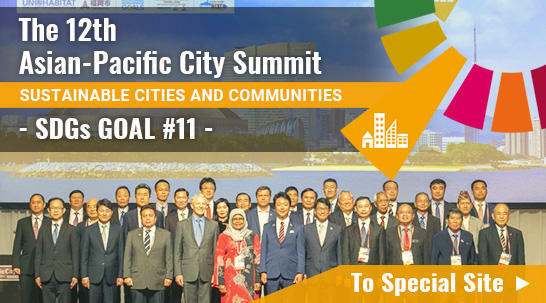 The shape of the wave in the center symbolizes the swell of actions to be created by the participating cities in the Asian-Pacific City Summit and the Summit itself. The symbol color Marine Blue is the sea including the Pacific Ocean and it symbolizes “Hope”, “Truth”, and “Trust”.